Javaid Masoud was given the opportunity to pursue the American dream in 1975 when he immigrated to the United States at the age of 14. His uncle, Dr. Fazal H. Ahmad, a general surgeon who served the families of a small town in southeastern Kentucky, sponsored his move from Karachi, Pakistan to Harlan, Ky. Masoud graduated from James A. Cawood High School in Harlan in 1978. 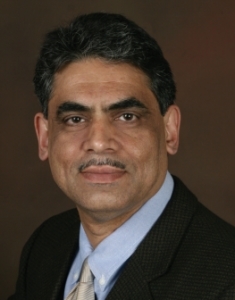 Intrigued by computing, he attended University of Kentucky and received a bachelor’s degree in computer science in 1982, and a master’s degree in computer science from Western Kentucky University in 1985. Masoud’s first job combined his love of airplanes and traveling with computing at Central Engineering Company in Minneapolis, Minn. As a software engineer, he computerized jet engine testing facilities by developing real-time data acquisition software with graphical user interface. In 1991, Masoud joined Medtronic, a global leader in medical technology and services based in Minneapolis. Starting as a senior software engineer and moving up in the technical ranks over 20 years, Masoud’s cumulative achievements were recognized when he was awarded the Medtronic Technical Fellow designation, the company’s highest technical honor. As a Technical Fellow, he became a key contributor to the strategic technical plan for the company and served as an educator, mentor and consultant. He received numerous honors, including Medtronic’s Star of Excellence, Customer Focus Quality and Initiative Creativity Excellence awards. Masoud joined Sorin Group as a senior director of patient management systems in 2011. In this role, he was responsible for leading an international team across the United States, France and Italy to mature new technologies from proof of concept to released products with wireless connectivity, hardware and embedded software. He partnered with senior leadership and cross-functional peers to develop strategic roadmaps for research and development. In 2015, Masoud became chief technical officer at Cellnovo, leading the world’s first mobile diabetes management system. He works closely with industry and leading academic institutions in the U.S., France and United Kingdom on artificial pancreas projects to treat Type 1 diabetes by implementing artificial intelligence algorithms in the system. Masoud has been granted 20 patents and has 32 patent applications submitted. He has presented at several scientific conferences including at Institute of Electrical and Electronics Engineers, Medical Design & Manufacturing, University of Minnesota and Food and Drug Administration events. Masoud lives in Saint Paul, Minn., with his wife, Bobbie Turner Masoud. They have two children.